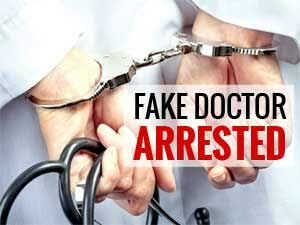 GURUGRAM: In yet another case of fake medical doctor running lose and treating patients, the Haryana police have now arrested a 35-year-old metric pass man, posing to be an MBBS doctor and treating people on the basis of his fake documents. It is reported that Ravinder Kumar Mandal (accused), hailing from Gangapur area of Bihar’s Madhepura district, was running a clinic in Madanpuri area of Gurugram on the basis of fake medical degree.The police report said that the accused earlier he used to work on call as an assistant in operation theatres (OT) of various hospitals. The police came to know about the same when one Dr Ravinder Kumar, a city-based doctor with a government hospital, filed a complaint at New Colony police station and stated that a person was running a clinic and was using his name and degree. Dr Ravinder Kumar told the police that he found his name on the internet when he was searching for a doctor, and suddenly he found another Ravinder Kumar Mandal, an MBBS doctor practicing. After the complaint, the police officers investigated and arrested Mandla, the owner of K K R Pali Clinic, in Madanpuri. The case was registered under the sections of 419 (cheating by personation) 420 (cheating), 467 (forgery for the purpose of cheating), 468 (forgery) and 471 (using a forged document as genuine) of IPC and relevant sections of the Indian Medical Council (IMA) Act.